Ah, raving! Those were the daysâ€¦ Sit back and relax, kiddies, as I fill you in on what a glorious era this was for music and culture. The late 80s and early 90s were a heady time of new technology, social advancement and rapidly changing fashions in clothes, art and music. The previous generations nihilism and greed gave way to something a bit softer, something that harked back to an earlier time; peace, love and unity were in the air. It was exciting - youth still had the possibility of controlling their own future, and from their vantage point back then the future looked bright. We would shed the inhibitions drilled into us by society and we would all come together under the influence of new music and new drugs, doing away with caste and creed. 808 State were one of the prime movers in the early British dance scene, and revisiting their work on the new 'best of' collection Blueprint shows that while the sounds themselves may have dated, the music has lost none of its charm. It's important to remember that 808 State were always a cut above your average rave-monkey act, coming from a Manchester post-punk background and possessing as they did genuine musical talents. New technology had proliferated hugely, making it easier than ever to make dance music, particularly the kind of formal, repetitive strains becoming known back then as 'European techno'. But, as fun as this kind of music may have been were, you just couldn't imagine an act like, say, Altern-8 whipping off the face masks, busting out a tenor saxophone and deliver a smooth-vibes chill out classic like 'Pacific State'. This was 808 State's first crossover hit and it had a huge impact. It showed that dance music could be funky and repetitive, which we all knew, but it was also showed it could be calm, intricate and beautiful. It was a massive progressions for dance music and paved the way for the likes of Future Sound of London and The Orb, both brilliant bands. Yeah, it also gave rise to Guru Josh, but we can let that one slide I reckon. Testament to the talent of 808 State is the calibre of guest they can count on to work with or be remixed by. BjÃ¶rk, Brian Eno, Aphex Twin, The Manics' James Dean Bradfield, Guy Garvey of Elbow and major league producer Trevor Horn tend not to work with just any Johnny-come-lately rave band in a Vicks-filled face mask, but they're all correct and present on Blueprint. Of all the guest vocalists, it's Bradfield who comes out the best, making 'Lopez' an actual tune your milkman could whistle, and elevating the gorgeous slide guitar backing up to the classic single status of 'Pacific State'. On 'Qmart' BjÃ¶rk does her warbly BjÃ¶rk-y thing, but as this was 1991 and she had yet to quit the Sugarcubes, it's fairly safe to say she was still finding her feet. Of the remixers, it's Aphex Twin who shines the most, turning album opener 'Flow Coma' into a acid-flecked breakbeat monster. I take it this was a track Aphex actually listened to and took elements from before slapping on the tag 'AFX Remix' (google "Lemonheads Aphex remix" if you don't know what I'm talking about). The Word Production remix of 'Olympic' from 808's 1991 album ex:el is great (even if it IS the theme from that dodgy 'yoof' TV classic The Word) but it strangely nicks the riff from another 808 single. That would be 'In Yer Face'. 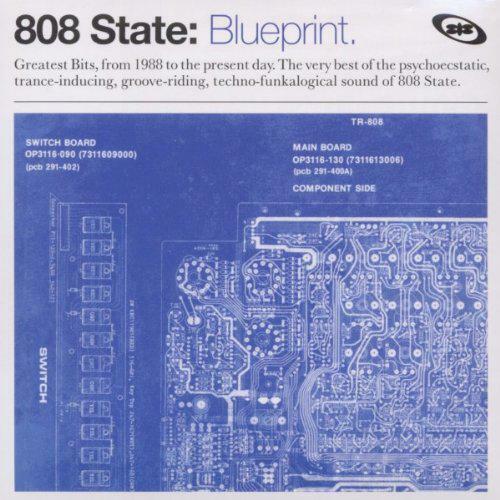 which is the quintessential 808 State track in my opinion, and one of the best rave tracks of all time, hands down. It's hard, it's nasty, it's funky and it's all tinged with a sense of angry melancholy best surmised by the doomy voice-over on the intro. Unfortunately 'In Yer Face' is not included on Blueprint in its original form, which is a real shame. Instead we get 'In Yer Face (Revisited)' and the aforementioned 'Olympic (Word Production Mix)' which are not bad, just not as good. Both have enough elements of the original to make you want to hear it, while lacking the original's knock-out power. The intro to 'In Yer Face', with its monologue about generational conflict and pollution, is perhaps the most iconic musical moment of the whole rave era. It's funny looking back now and thinking about the genuine threat the police felt from the rave scene. Anyone who has ever taken a pill can tell you it's not exactly a violent or threatening experience. But then go and watch any old footage of outdoor raves on YouTube and you can begin to understand. Raving really was a social phenomena - an unlicensed, unregulated party in a field could attract anywhere up to 25,000 people, a leader-less congregation who thought and felt the same and who came together to experience new music as a new drug experiences. It was an organic happening, an idea seeded by a few people which spread across the country and then the world. It wasn't a marketing gimmick, the were no corporate tie-ins, there was no social media to gain instant access to the party or to track people's whereabouts and tastes - it's no wonder the police were worried. But what had they to be worried about? Was raving so much a threat to the people involved or adjacent or more a threat to established hierarchies and modes of living? I'm not sure really, but whatever 'rave' was, 808 State played a fundamental, integral part. Much of the material on Blueprint is different from its original form, making this an album that even the die-hard 808 State fan should own, with four of the tracks being 'revisited' and nine out of the total 17 tracks being previously unreleased. Which I guess makes this album not actually a greatest hits compilation, but a collection of rarities? The album itself is sub-titled "Greatest Bits, from 1998 to the present day". which makes me wonder when the actual Greatest Hits of 808 State album is going to arrive, or the deluxe, remastered and expanded editions of Newbuild, 90 and ex:el are going to be released. Because they should. In the meantime, if you need an introduction to this influential and under-rated act then look no further. Like raving itself, it may seem dated from our 20 year vantage point, but let yourself go, maaan, just feel the vibes, yeah, and get on one with a great album from a brilliant band.